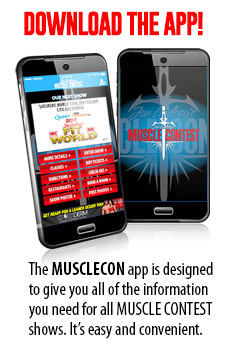 The following is general information only for the 2019 MUSCLECONTEST IRELAND. It is not intended to supersede or replace any other information. Please contact us if you have any questions. The entry fee for this event is €200 (Approx $228.00 USD) PER CLASS ENTERED. PLEASE NOTE: There is no late fee for this event. 1. The entire lineup is called onstage in numerical order and forms in equal numbers along diagonal lines at each side of the stage. The center stage area is left clear. 2. The head judge then directs groups of competitors in numerical order through the quarter turns and mandatory poses. The size of the groups is at the discretion of the head judge. 4. The entire lineup is then called back onstage in numerical order and forms in equal numbers along diagonal lines at each side of the stage. The center stage area is left clear for the callouts. The head judge then directs selected competitors through the callouts, where the selected competitors are compared against each other in the quarter turns and mandatory poses. The number and placement of competitors in the callouts is at the discretion of the head judge. 1. Each competitor is called onstage individually in numerical order and has up to a maximum of 3 minutes to perform a posing routine to music of the competitor’s choice. 2. The entire lineup is then called onstage in numerical order and forms in equal numbers along diagonal lines at each side of the stage. The center stage area is left clear for the callouts. 3. The head judge directs selected competitors through the callouts, where the selected competitors are compared against each other in the quarter turns and mandatory poses. The number and placement of competitors in the callouts is at the discretion of the head judge. 4. The competitors then perform a 60-second posedown to music of the promoter’s choice. Up to and including 5'4" - up to and including 160 lbs.